I bet you are so excited I finally got to the end of this series! 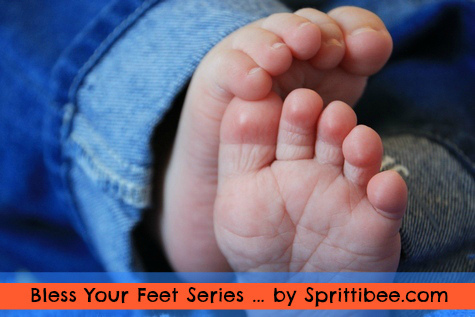 Sorry about all the distractions, but you know how life is… our little feet are constantly on the move. In case you are just joining the foot discussion, you’ll be completely lost without reading post 1, post 2, and post 3 of the series first. 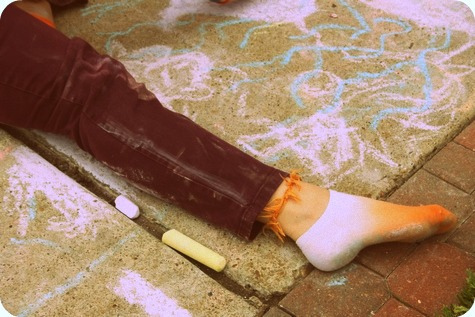 We are talking about Physical Feet today… first we covered the basics, then we covered GOOD Spiritual Feet. The last post was about BAD Spiritual Feet – and what they might look like. This week we’re talking real feet – ugly feet, even – how to take care of the feet – and foot taboo. Song of Solomon 7:1 – How beautiful your sandaled feet, O prince’s daughter! Your graceful legs are like jewels, the work of a craftsman’s hands. The God who wrote the Bible knows your feet pretty well… after all, he designed them. He gave you life to use them. He sustains them every moment. I know it’s sometimes hard to see ourselves as a masterpiece when we are swimming in a sea of humanity, and sometimes feel like bottom feeders… but each and every one of us is a beautiful pair of feet to the Lord. We are here on this planet to be His hands and feet – to reach out to the lost and the needy and lend them our hearts and service in the name of Christ. 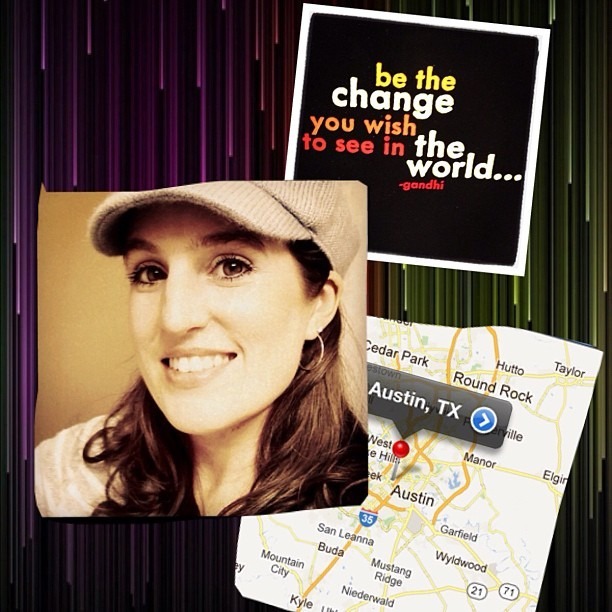 I am glad that someone reached out to me…. I only hope I can return the favor. I’ve got a daisy on my toe. It ‘ain’t alive and it don’t grow. It’s just a tattoo of a flower. Makes me look purdy in the shower. It’s on the second toe of my left foot. I got a daisy on my toe. My right foot loves my left foot so. Such a cute song. Another friend of mine that I met at one of my first jobs had a little girl who spoke English and Spanish, both. She was only about three, and she called her feet “Feditos”. I sometimes call them that just for fun. Here below, I have copied a few feet tidbits from email and the web. I gathered them from various places, and gave credit where credit was due. Feet in the bible were constantly being washed… there are over 26 references to the washing of feet! God even gave the Hebrews a law regarding the washing of feet – the priests were to wash their feet before they entered the Ten of Meeting, and if they did not, they would die (Exodus 30:17-21)! I doubt if you never use lotion, never get a pedicure, and you let your feet get sunburned you are going to die… but it stands to reason that we should care for them – they are, after all, the only feet we’ll ever get. To get right to the point — and to make a sweeping generalization — men have the strangest notion of style when it comes to socks and sandals. How many times has your head swiveled in horror as your eyes beheld black socks with sandals on some amazingly pale man’s feet? Sandals & Socks 4 Ever is a salute to that international trend among men to make poor choices in this area. Scroll down the page to see photographs from around the world of men wearing socks and sandals. The good thing is that not all of them are dark socks, but that may not make up for the outfits and the bellies that accompany some of these images. Actually, there are instances where the dark socks look all right, until you notice that they only come slightly above the ankle, and are being worn with long pants. You’ll be knee-deep in chuckles as you cruise through the shoes here. And then there’s Socks With Crocs – the song by Taft Brown, for those men who want to justify their fashion faux pas. I just love it! 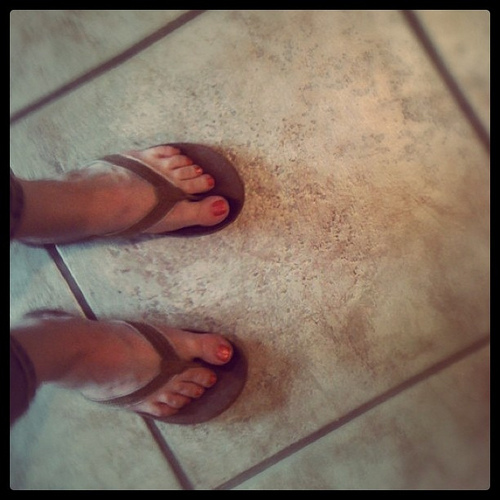 Take the Women’s Summer Sandals Foot pledge! I promise to always wear sandals that fit. My toes will not hang over and touch the ground, nor will my heels spill over the backs… and the sides and tops of my feet will not pudge out between the straps. I won’t wear pantyhose with my sandals even if my misinformed girlfriend/coworker/mother/sister tells me the toe seam really will stay under my toes if I tuck it there. If a strap breaks, I won’t duct-tape, pin, glue or tuck it back in to place hoping it will stay put; I will get my shoe fixed or toss it. I will resist the urge to buy jelly shoes at Payless for the low, low price of $4.99 even if my feet are small enough to fit into the kids’ sizes (this is out of concern for my safety, and the safety of others). I understand that no one can walk properly when standing in a pool of sweat, and I would hate to take someone down with me as I fall and break my ankle. I will be brutally honest with my girlfriend/sister/coworker when she asks me if her feet are too ugly to wear sandals. Someone has to tell her that her toes look like they’ve been dragged behind her car on the way to work and no sandal in the world is going to make her feet look good. I will promise if I wear flip flops, that I will ensure they actually flip and flop, making the correct noise while walking and I will swear NOT to slide or drag my feet while wearing them. I will promise to go to my local beauty school at least once per season and have a real pedicure (they are about $20 and worth EVERY penny). I say spend another $15.00 and get an even better one! But then, you don’t have to take the pledge if you slide in to some fancy cowgirl boots. They are virtually indestructible and keep fire ants at bay. No one knows your socks don’t match, either. And, you can keep lotion on your feet all day as you boot-scoot-boogie all around town. I would suggest getting a pair that are 1/2 size too big so they are really comfortable and you can double your socks up if you plan to walk all day (that’s what I do at conferences). 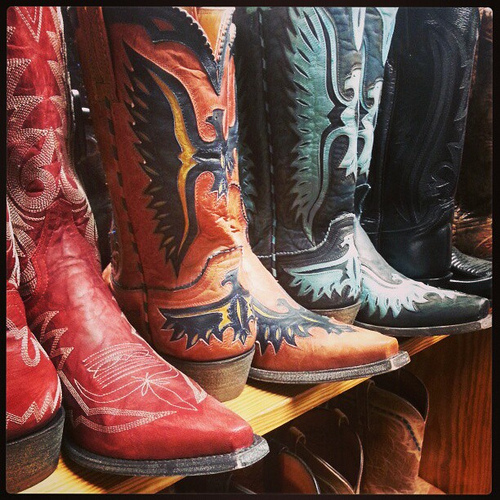 LOVE my boots… which are Ariats. One day, when I’m all growed up (and somewhat richer than I now find myself), I’m going to own a pair of Old Gringo , too. Note to readers: This series was broken down into four different posts, on four different days to make it easier to ‘digest’. I originally posted this in 2005 after just starting my blogging journey. I’m updating a few of these older posts now and then to refresh them and add new photos. I hope you enjoy the re-run! Disclaimer: There are Amazon Associate Links in this post. Hee hee. I love it. I sign the pledge…except for the touching up the big toe thing. That is a busy mama’s RIGHT! 🙂 Thanks Holly. Glad to know someone reads my rantings. I also do the touch ups on the toes… more than just the big toe. I have about 3 layers on right now – 2 red, and one copper! I think it’s time for that home pedicure I linked on the post! hi. I’m a pastor’s wife in CA who has a missionary friend in Venzuela, who mentors other pastor’s wives there. My friend asked me to send her some tokens that she could give her mentees for encouragement. I chose several pairs of fluffy, colorful socks and the verse in Romans about ‘beautiful feet’ came to mind. Thanks for doing the ‘digging’ – I’ll send her your ‘Bless your Feet’ series with the socks! That is cool, Connie!!! I hope that she likes it. Thank you for telling me. 🙂 It is nice to see the “invisible lines” between people (as Helen Keller says) and how we fit in with eachother in God’s larger plan. Is there anything more precious on this earth than baby feet? Thanks for the posts. I love object lessons. Just found your site. I love it. I was looking for some practical ways to teach preschooler the verse “How beautiful are the feet…” Thanks. You gave me great ideas. Youre going on my fav. Thank you for your research and message. God has spoken to me through this.